Prince Harry, Duke of Sussex and Meghan, Duchess of Sussex meet Grant Trebilco and Sam Schumacher, founder and co-founder of OneWave, a local surfing community group raising awareness for mental health and wellbeing at Bondi Beach. 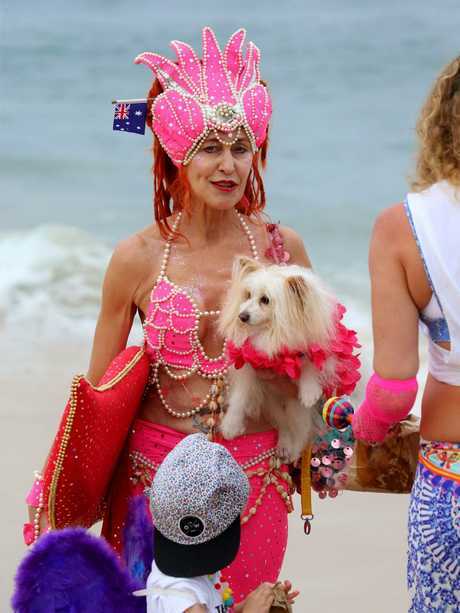 MEGHAN and Harry's arrival at Bondi Beach has gotten off to a bizarre and colourful start. The crowds lining the iconic beach screamed as a motorcade made its way down Notts Ave. 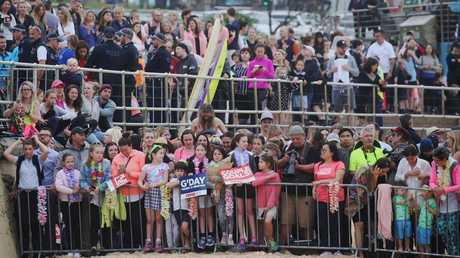 Prince Harry and Meghan Markle swiftly got out and made their way down the steps of the southern end of the beach, where they took part in the most Bondi event ever. 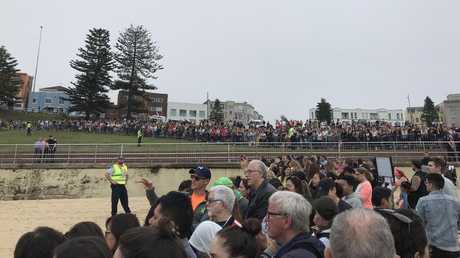 Prince Harry, Duke of Sussex and Meghan, Duchess of Sussex have arrived in Bondi. 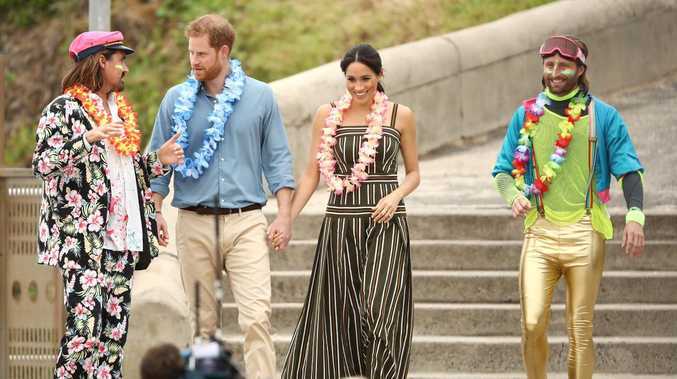 The royal pair immediately kicked off their shoes and were given pink and blue floral leis to wear, as they sat in an "anti bad vibe" circle with 20 members of OneWave, a non-profit surf community that raises awareness for mental health. After 15 minutes of discussing mental health issues, the surfers on the sand with Meghan and Harry put their arms around each other for a group hug. The royal couple then stood up in their leis and started chatting on the beach with the colourfully-dressed surfers. 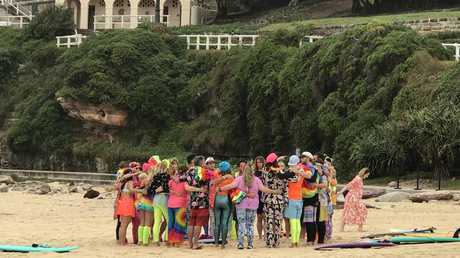 Members around the circle were donning bright colours for Fluoro Friday, a OneWave event where people share their experiences with mental health issues and interact with others while surfing and doing yoga. The royal pair looked relaxed and happy as they sat with locals, both rocking a casual, more summery look than they did in rainy Melbourne yesterday. Meghan Markle wore a full-length striped Martin Grant dress, while Prince Harry wore a sky blue button-up shirt loosely tucked into beige chino pants. Security is out in full force for the event. Royal fans lining the iconic beach yelled "There's a sniper on the roof!" 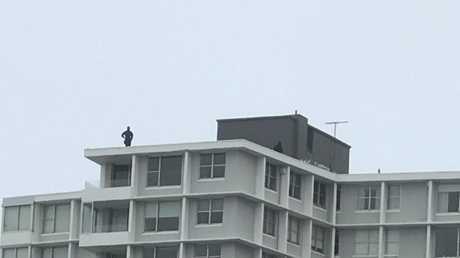 as two police dressed in black and holding guns appeared on a high rise apartment block overlooking the southern end of Bondi Beach. 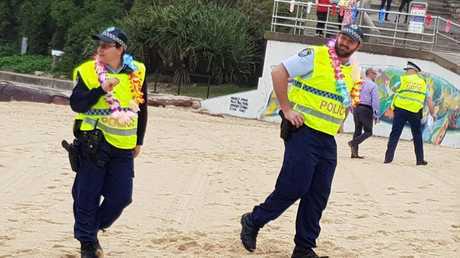 As with any royal visit, there's a heavy security presence on the ground as well - but they're looking more colourful than ever in their leis. 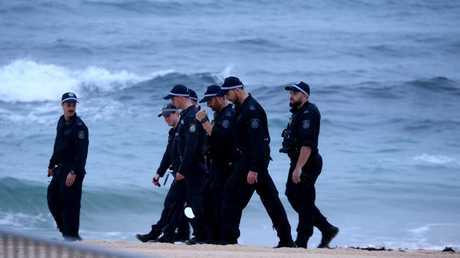 Barriers have been erected on the beach extending into the waves, where board riders appear to have been told to keep away from Bondi's famous southern end surfing spot. Security are frisking the crowd at the barrier, checking gifts the public might have for the royal couple. "Have you got any knuckle dusters or knives?" one lei-wearing official jokingly asked a woman as she showed him the contents of her bag. 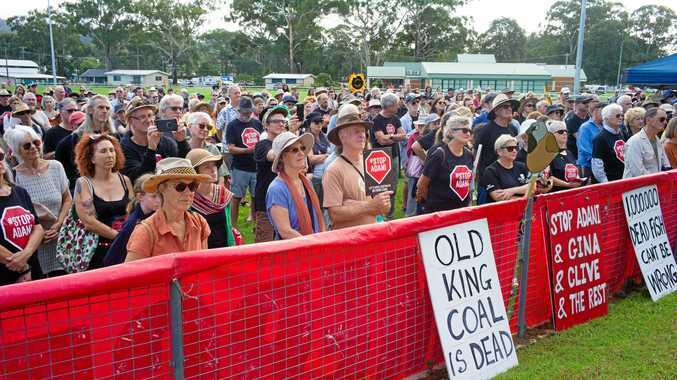 It's a step down from Tuesday's Opera House visit though, where royal fans had to enter the area through a security check and have their bags scanned. No checks were in place at Bondi today. Members of Bondi’s One Wave group, the surfing community’s mental health and wellbeing awareness group, arrive on Bondi Beach to take part in Fluro Friday where they will share their experiences with mental health issues while surfing and doing yoga. 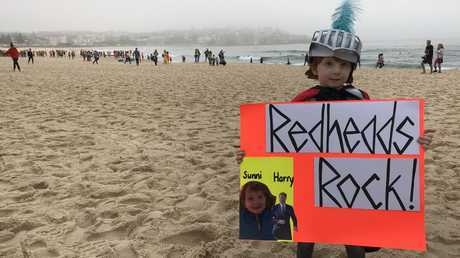 Fans have been gathering on the golden sands of Bondi since 6am this morning - and one pair may have prepared the most Aussie gift yet for Meghan and Harry. Jarrod Allen and Giovani Testini have rolled up to give the couple a traditional Bondi welcome - in budgie smugglers. They've even come armed with a tiny pair of swimmers for the royal baby. "We did it when his brother came last time," Jarrod said of Prince William's 2014 visit. 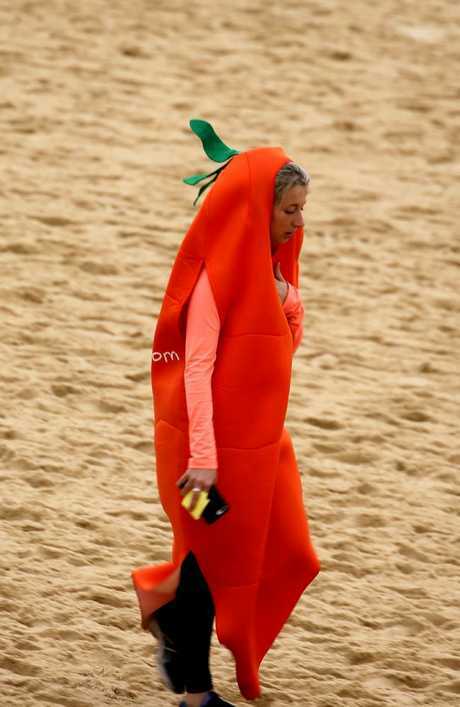 There are plenty of unique outfits on display, including colourful tutus, neon headdresses - and even a giant tomato costume. 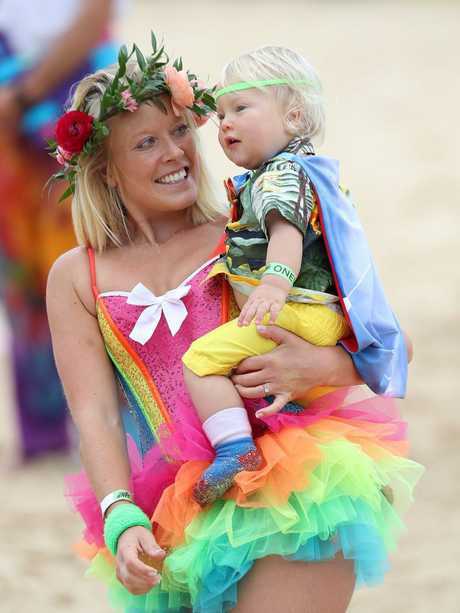 A woman and child dressed up to take part in 'Fluro Friday', which is part of OneWave, an awareness group for mental health and wellbeing. Hope Meghan and Harry like tomato sauce! British university student Lissy Broad, 20, is here for one reason. "My mum's a huge fan. She camped out for their wedding. I'm here to rub it in her face," she laughed while applying mascara, in case she meets the prince. Little Sunni has a special message for Prince Harry. 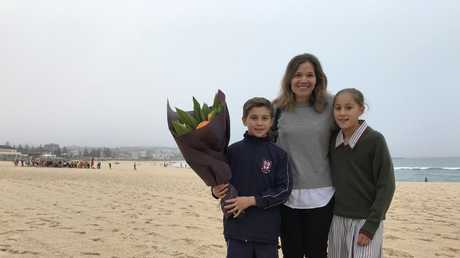 Local mum Athena brought her two kids James, 9, and Helena, 11 down to catch a glimpse of the couple before school. "We've always been fans of Harry but even more since Meghan came on the scene," Athena said. She's an everyday individual. It's nice to have someone so down to earth." Local mum Athena is hoping to catch a glimpse of the royals. The Duke and Duchess of Sussex will spend the morning in Bondi. Later today, Prince Harry is expected to climb the Sydney Harbour Bridge with Prime Minister Scott Morrison and Invictus Games competitors to raise the Invictus flag. After that, Meghan and Harry will meet Opposition Leader Bill Shorten at Admiralty House, followed by a meeting between the Duchess and the PM. Security on the scene ahead of the famous couple’s arrival. Now that’s a unique outfit!